In Turkish, the word “ayca” means the rising new moon- a time considered magical to begin, create, cultivate and develop. 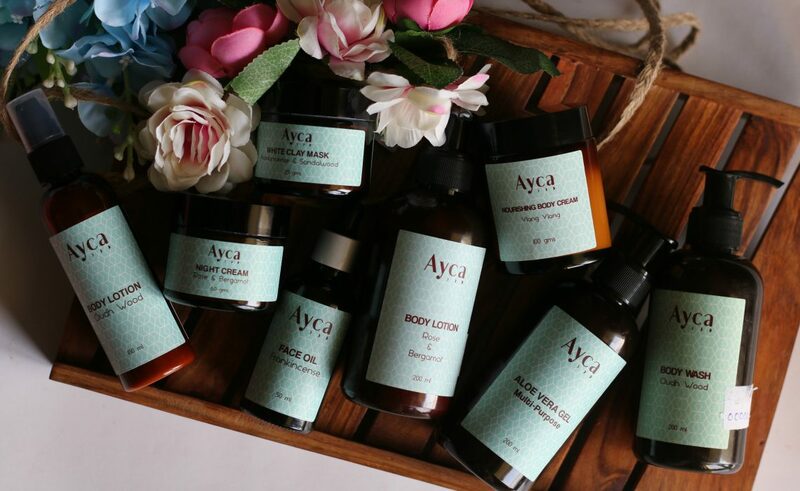 I got introduced to this wonderful brand ‘Ayca’ which is a luxury bath and wellness brand that creates products using all natural ingredients and traditional Indian home remedies. For a nature lover like me, their products were ‘love at first sight’. Aloe Vera gel has anti-inflammatory and cooling properties and it is the best soothing gel for face and body. Back in home at Kerala, I used to have Aloe plant and getting pure Aloe was super easy. Here, I find it difficult to grow them and I have never found a multi purpose Aloe Vera gel anywhere. 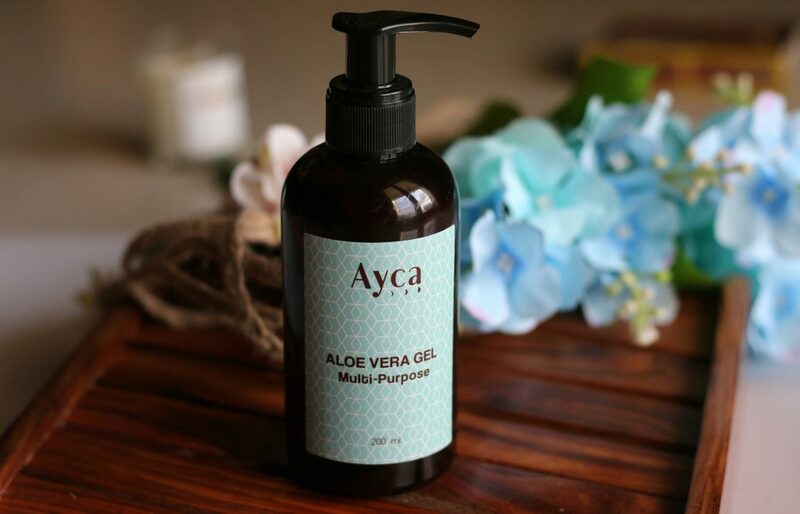 When I received this Aloe Vera gel from Ayca, I knew this would be benefited in so many ways. 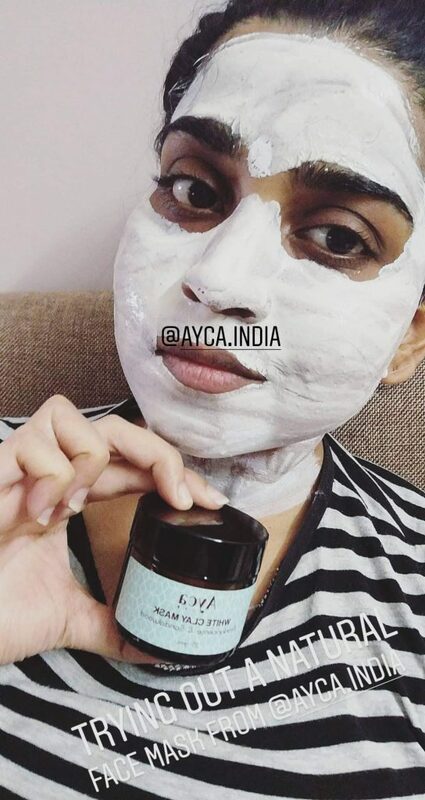 Ayca Aloe Vera gel is a soothing and non-greasy multi-purpose pure aloe vera gel formulation which can be used as a face & body moisturizer, after-wax/shave balm and also as a healing formula for cuts, burns, insect bites and sunburn. Paraben & SLS Free Formulation. It soothes sunburns, rashes etc. 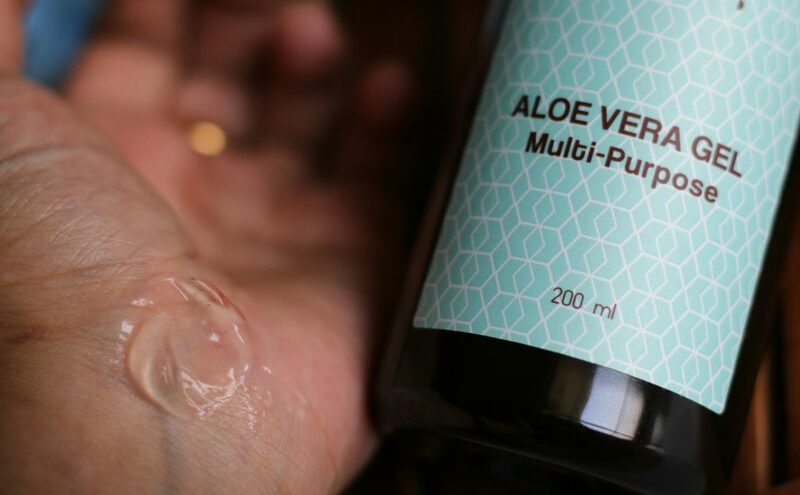 When you apply aloe gel on the area, It provides a protective layer to the skin which helps retain moisture. Aloe is also rich in antioxidants that helps in healing. I like the packaging of Ayca Aloe Gel. Most aloe Gels in the market are either in tub form or comes in a bottle without any pump. 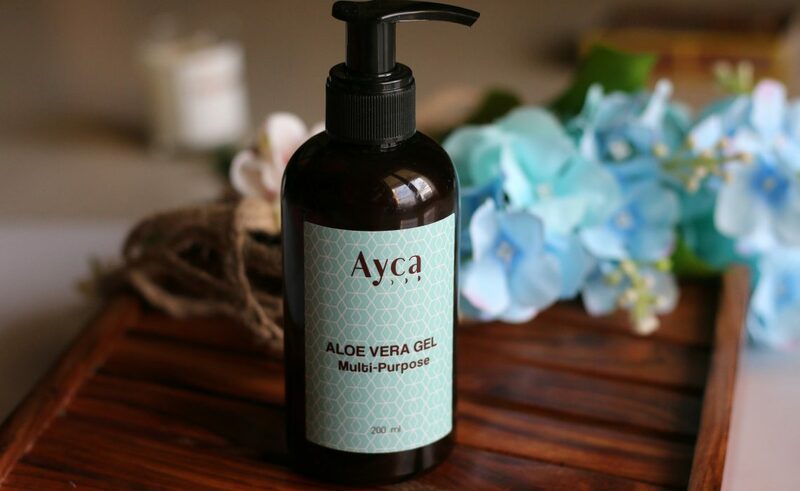 Ayca Aloe Vera Gel’s packaging makes it super easy to dispense the right amount of product. I like to use it as a face and under eye gel. It gives me that cooling effect when I use gadgets for a long time. I also like to use it on my legs and body area whenever I feel my body skin is not hydrated much. It’s also an excellent facial massage gel as well as a hydrating gel to be applied under your makeup. As it hydrates skin, without leaving a greasy film on the face – It’s perfect to be used under makeup too. It softens the skin without clogging pores. People also say that Aloe Gel can be used for hair. I never tried it. I prefer to use it for my face and body. Key Ingredients: Pure Aloe Vera with a cellulose derived geling agent. ‘cellulose derived geling agent’ – There is no geling agent name mentioned here. I don’t know what that is. From google, I got to know that its a ingredient that gives a gel like consistency to the product. If you are looking for a multipurpose Aloe Vera Gel made without any parabens or sulphates and comes in a convenient packaging. 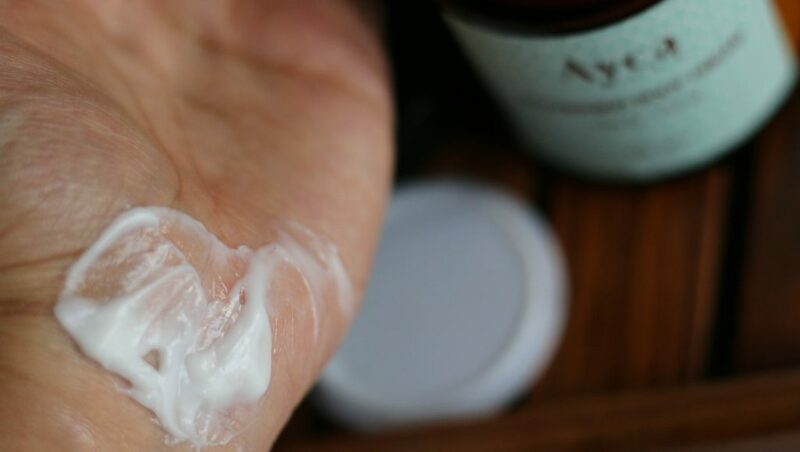 Here you go – Ayca Aloe Vera gel is a soothing and non-greasy multi-purpose pure aloe vera gel that can be used as a face & body moisturizer, after-wax/shave balm and also as a healing/soothing formula for cuts, burns, insect bites and sunburn. 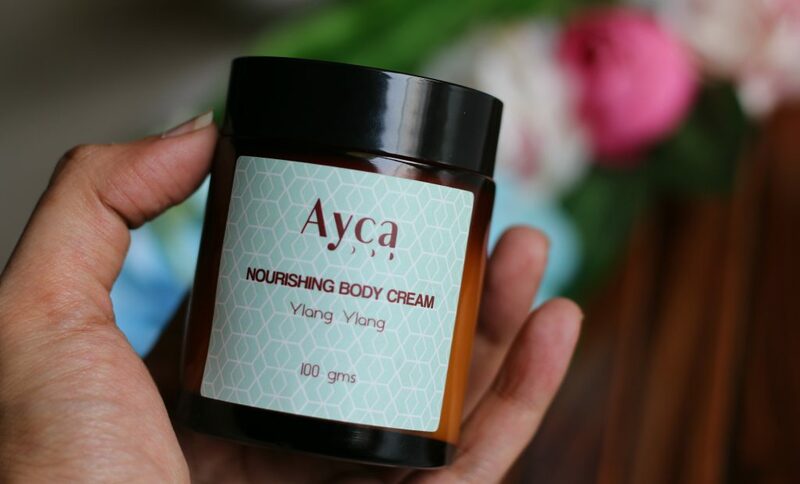 Ayca Nourishing Body Cream – Ylang Ylang is enriched with beeswax. Brand claims that it is effective in reducing stretch marks, cellulite and nappy rash. Paraben & SLS Free Formulation. 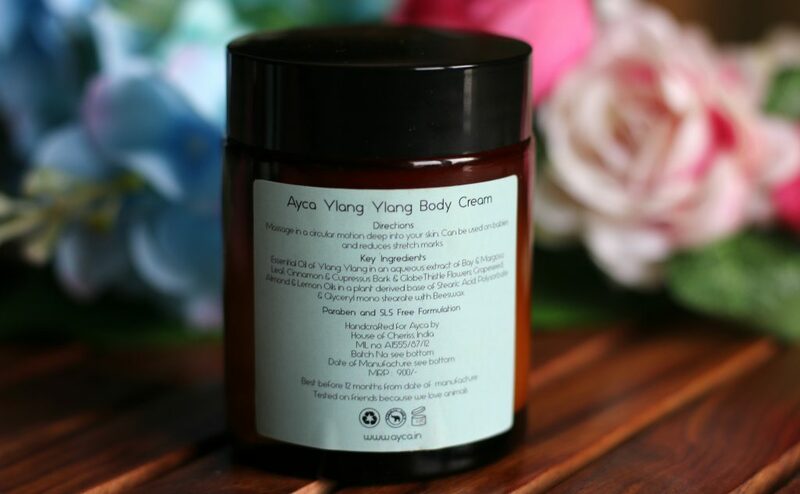 Ayca Ylang Ylang Nourishing Body Cream is perfect for (very) dry, damaged, normal, as well as mature skins. 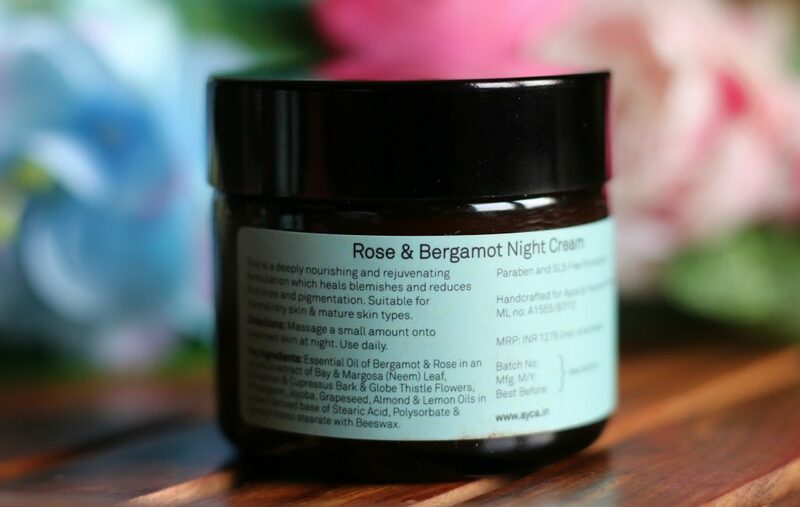 Perfect for moisturising your body, neck, hands and feet . One other hack I use while I shave my body area is to apply in some body butter before I begin to shave the area. especially my leg area. I find it super easy to shave with a body butter on the area. 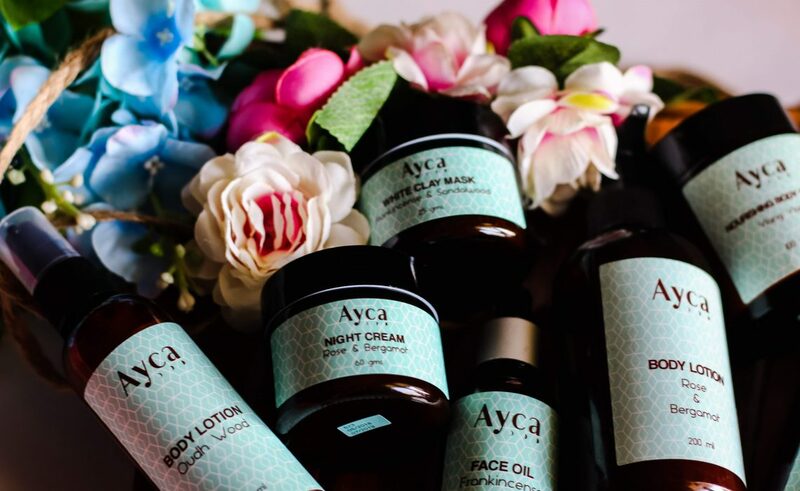 The packaging is in a round glass bottle with the perfect minimalist labelling from Ayca. I use a spatula to scoop the product every time. Ylang Ylang is one of my favorite fragrance and a body butter with Ylang Ylang was something that I couldn’t afford to miss. 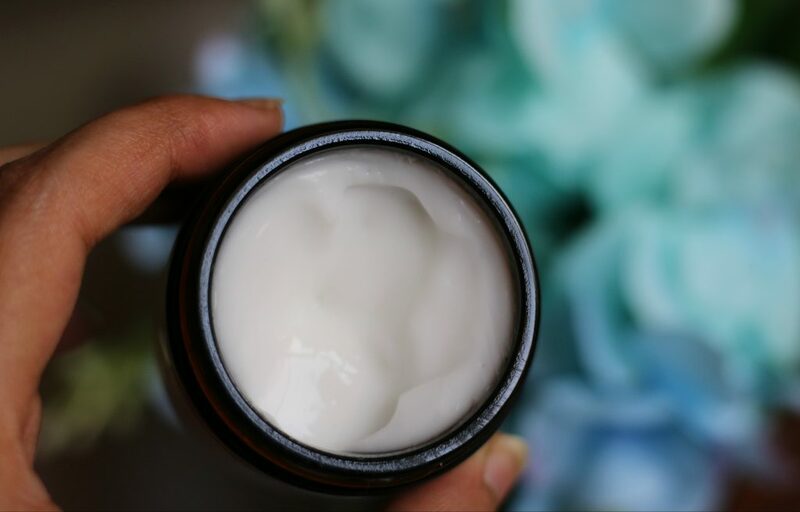 This luxurious, body butter has a thick creamy consistency. It hydrates without leaving the area greasy and that’s what I love about this. During extreme winters, this is a saviour. I love the relaxing fragrance of Ylang Ylang. How to use: Apply and massage in a circular motion until absorbed. I prefer to use it at night. 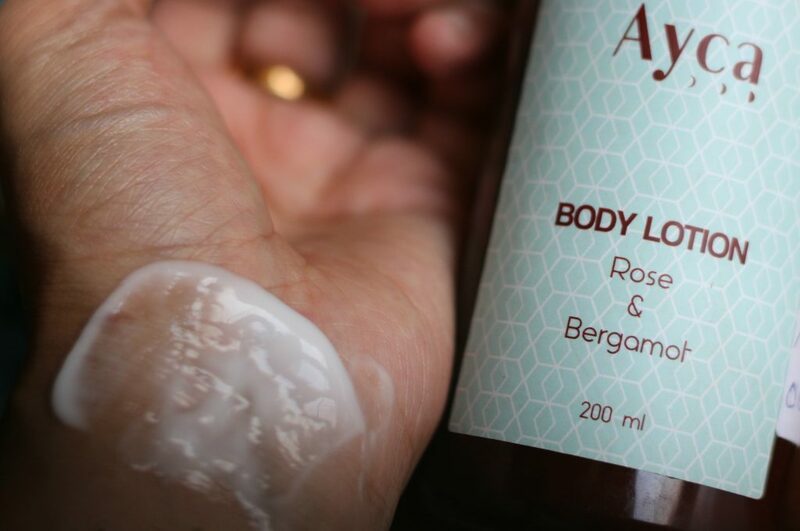 If you love Ylang Ylang fragrance, this body butter is not to be missed. It’s relaxing, soothing and provide intense hydration to your body without leaving any greasiness. 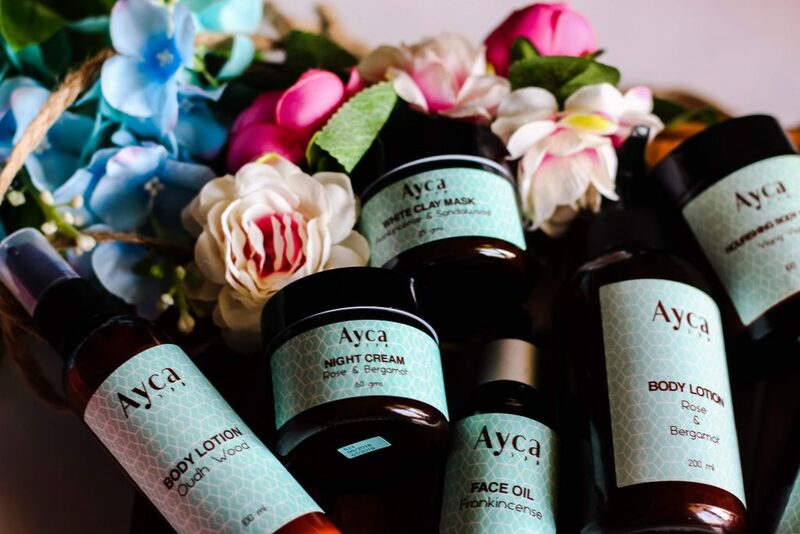 The floral Ylang Ylang blend of essential oil in this body butter makes Ayca Ylang Ylang Nourishing Body Cream a wonderful addition to your after shower night routine! Ayca Rose & Bergamot Body Lotion is a super lightweight non-greasy body lotion for your delicate skin. 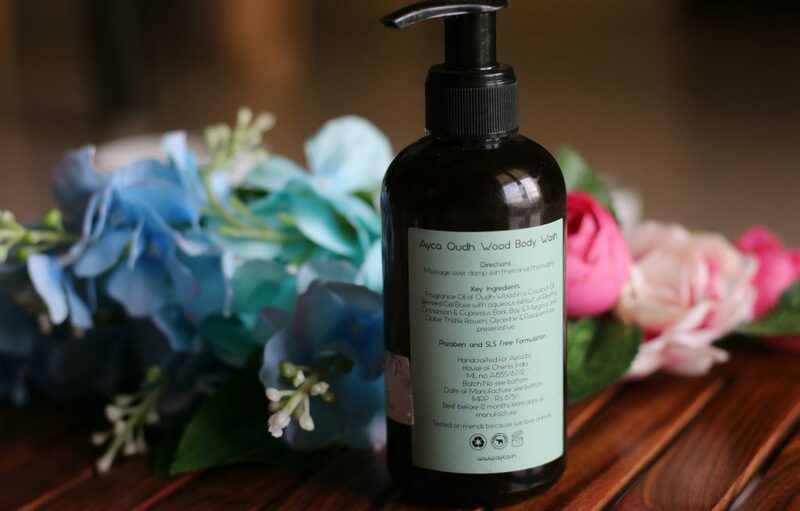 It nourishes and moisturizes the skin. It has this enchanting aroma of Rose and Bergamot that will leave your skin sweetly perfumed all throughout the day. Massage gently on skin, preferably right after a shower/bath. I love the packaging. Pump makes it easy to control the product. It’s very light weight on skin and that’s my go to lotion during day time. It hydrates body area really well. The floral accords lasts almost the whole day and that’s something which I have never found in other body lotions. Ayca Oudh Wood Body Wash is a mild foaming gel cleanser is specially formulated to gently and effectively purify the skin, leaving it soft and hydrated, enriched with the woody aroma of Oudh Wood. Paraben & SLS Free Formulation. My husband love this. He use it everyday for this night shower and he says it has a woody, spicy aroma that is perfect for a warm bath before sleep. He says, on a loofah in contact with water, It forms rich lather. This body wash has a permanent position in the shower rack now. A body wash perfect for men. 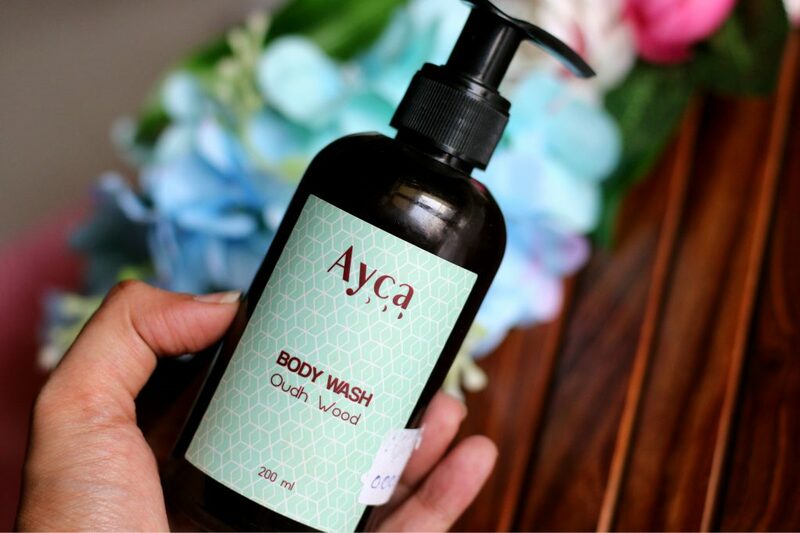 Woody, rich aroma of Oudh Wood is perfect for a night shower routine. 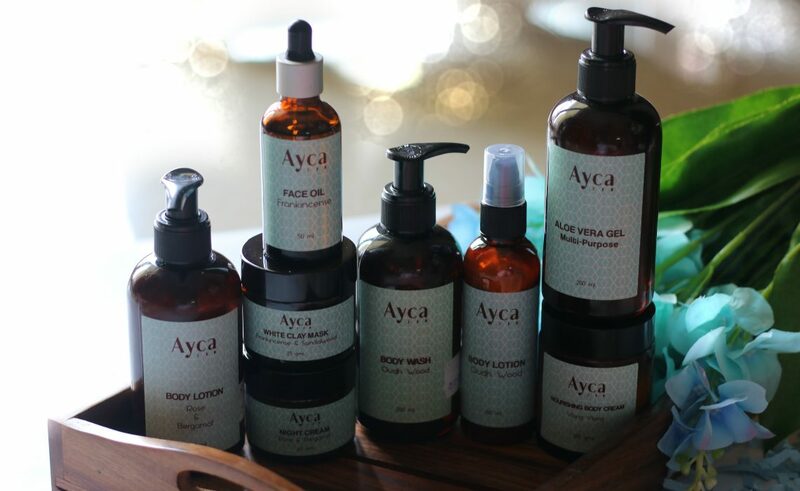 If you are looking to gift your loved one – You can opt for this from Ayca Range. 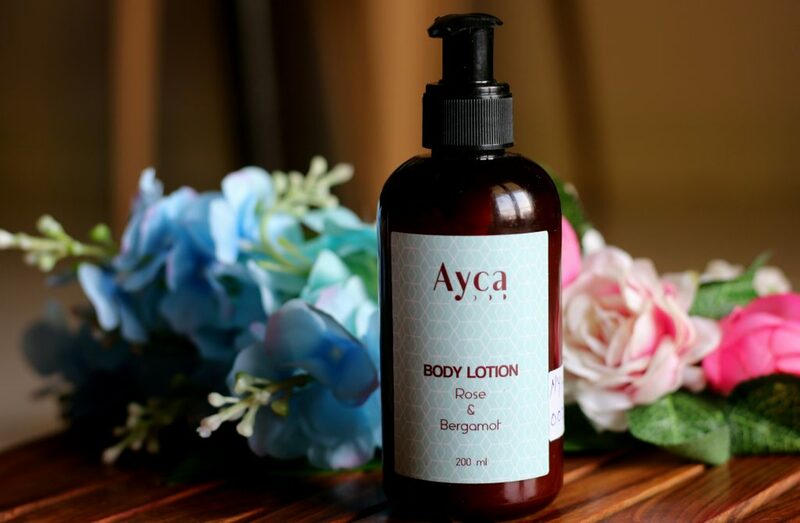 Ayca Oudh Wood body lotion is a light, non-greasy formulation that moisturizes the skin leaving it gently fragranced with the woody aroma of Oudh Wood. Paraben & SLS Free. My husband use this after his shower using Oudh Wood Body Wash. He like the woody, spicy fragrance of Oudh Wood. I think it’s a perfect body lotion for men. Light weight and fast absorbing too. 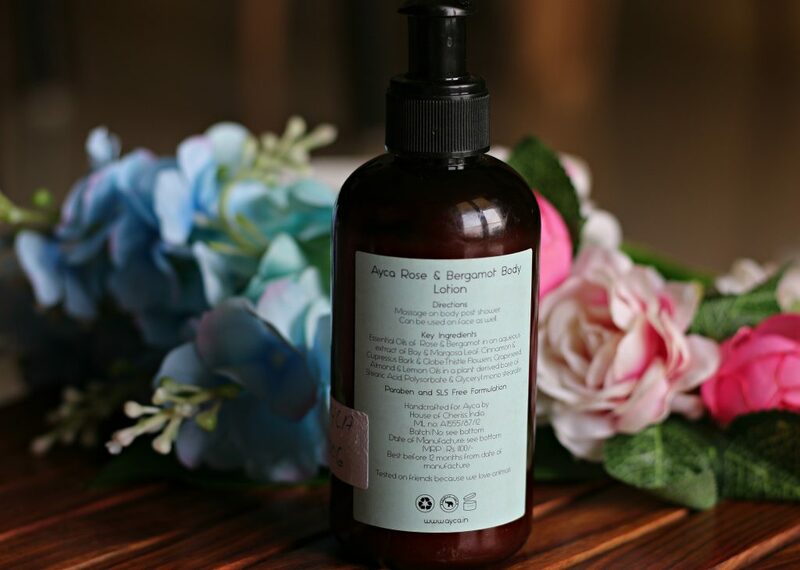 Apply on skin generously and massage gently until absorbed, preferably after a shower/bath. 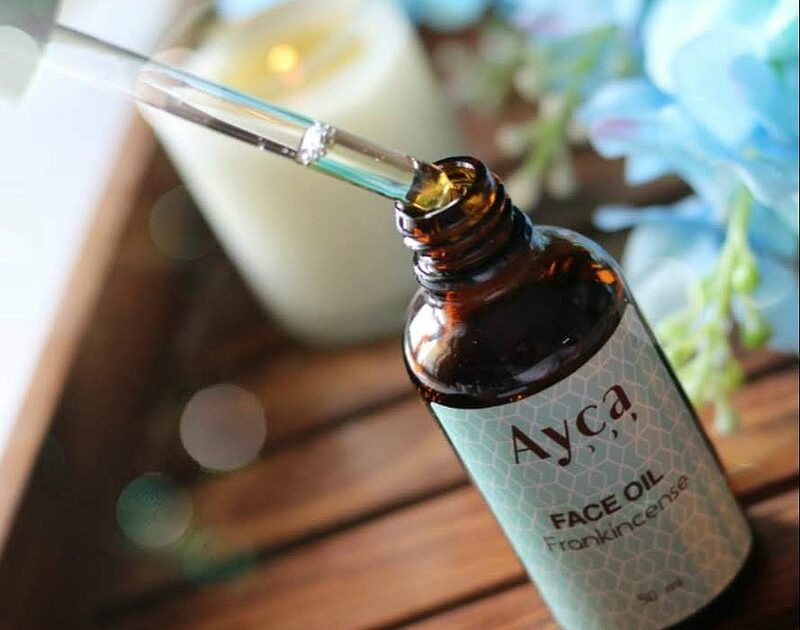 Key Ingredients: AgarWood Oil in an aqueous extract of Bay & Margosa (Neem) Leaf, Cinnamon & Cupressus Bark & Globe Thistle Flowers, Grapeseed, Almond & Lemon Oils in a plant derived base of Stearic Acid, Polysorbate & Glyceryl mono stearate. 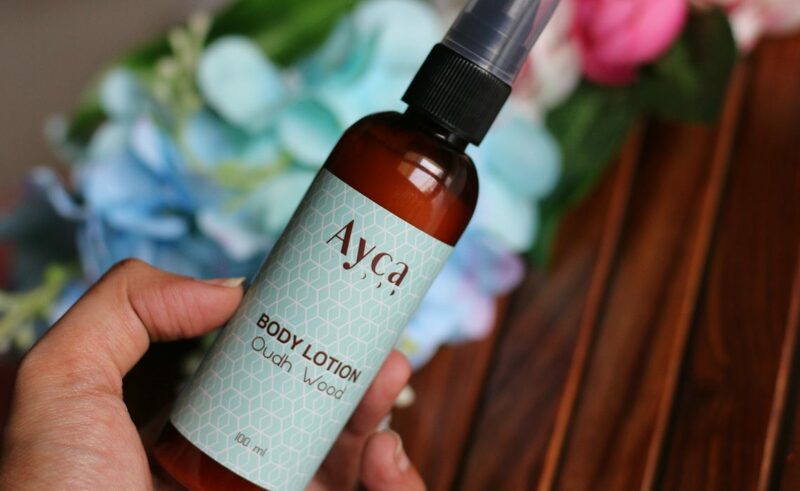 Overall, a light, non-greasy formulation that moisturizes the skin leaving it gently fragranced with the woody aroma of Oudh Wood. Paraben & SLS Free. My husband like to use this after his shower using Oudh Wood Body Wash. He like the woody, spicy fragrance of Oudh Wood. I think it’s a perfect body lotion for men. Light weight and fast absorbing too. I mix about 1/2 teaspoon of clay with rose water to make a paste. Gently apply to face and allow to dry for 5-10 minutes before rinsing off with cool water. I love the feel of this mask on my face. It gives a tightening effect to the skin. It’s not very drying on skin too. Within 8 minutes, the mask dries and it can be wash off using cold water. My skin felt radiant after using it. 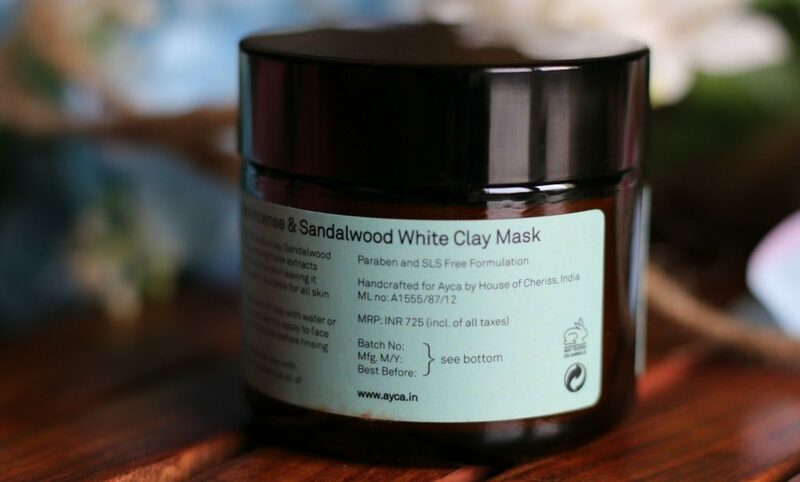 Overall, Its a effective and gentle-on-skin weekly mask that can be used to deep cleanse the skin. It only has natural ingredients. Free from Parabens and SLS. Gives a radiant glow to skin. Effectively takes away all impurities from your face. 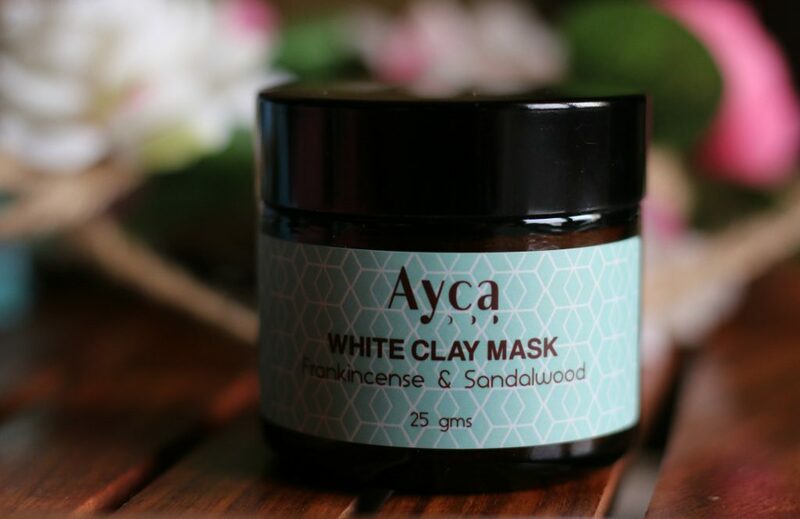 If you’re looking for a natural everyday alternative to replace your chemical face masks – you might want to give this a try. Apply the mask two or three times a week to start, and gradually lower that amount until you can maintain the desired results. 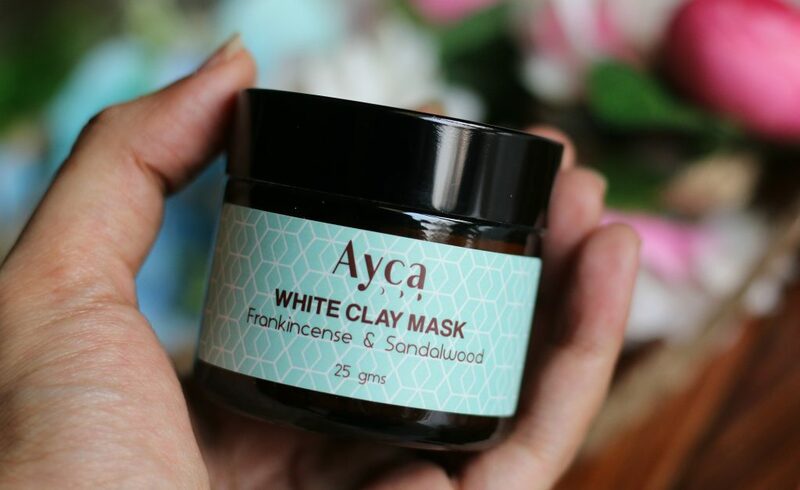 If you have dry skin, try using this clay mask with milk and rose water once a week to start with. The natural lipids found in milk will rejuvenate your skin and helps reduce redness and itchiness. I like the minimalist glass bottle packaging with a glass dropper. 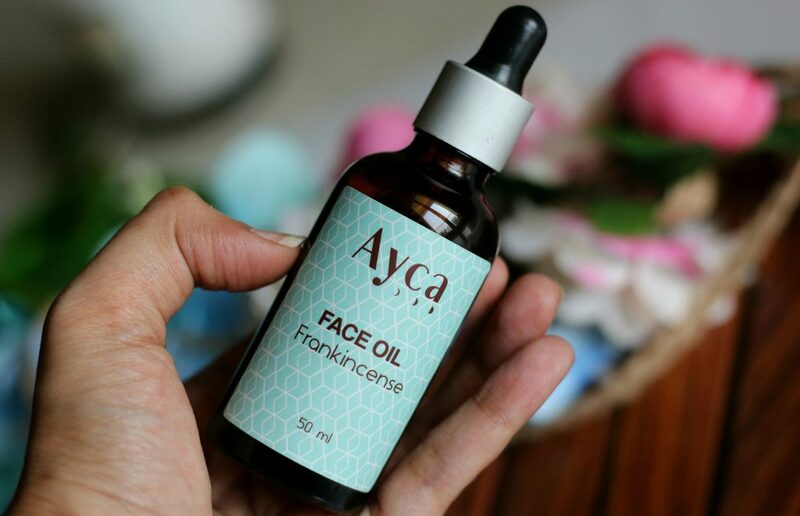 You may use it daily at night time, after cleansing and toning your skin. 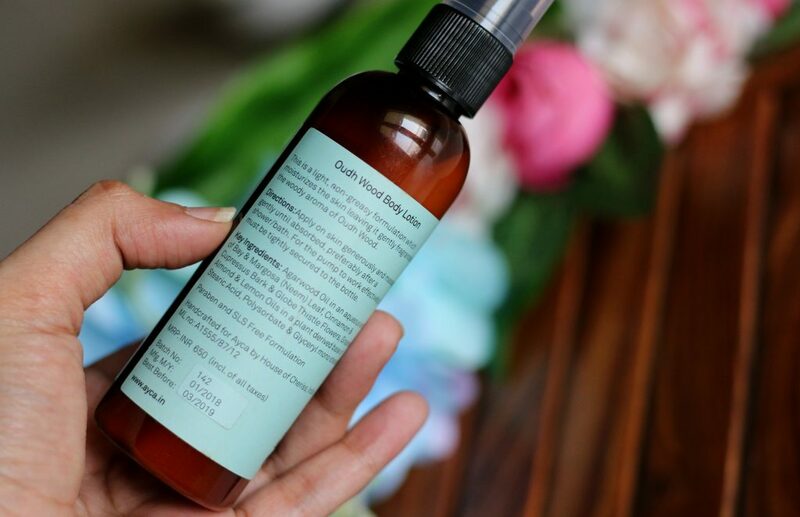 I spritz some rose water to my face after cleansing and take about 2-3 drops of this oil into the palm of my hand, then using my fingertips, I gently massage this luxurious oil blend into my face, neck and décolleté area, in a gentle upwards circular movements, taking special care around the delicate eye area. I feel very relaxed to massage this oil onto my skin at night. 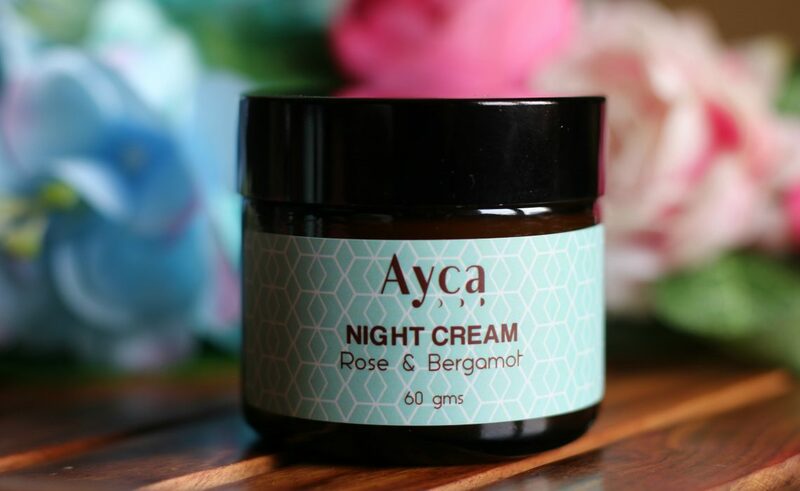 For best results follow up with a light weight hydrating cream such as Ayca Rose and Bergamot Cream. 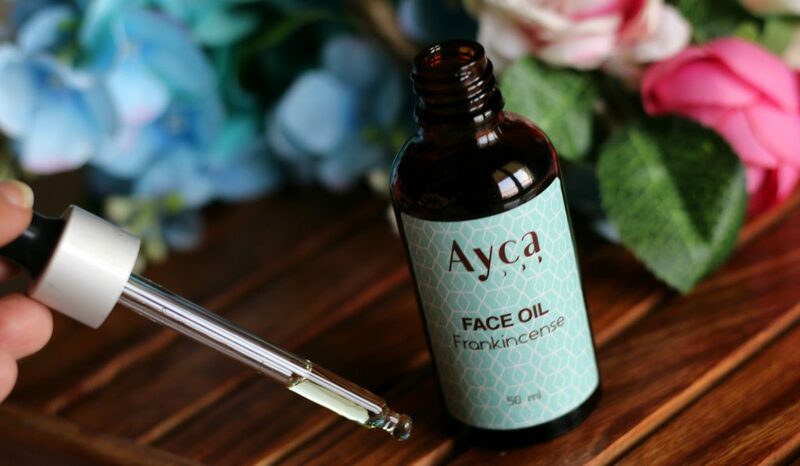 Regular use of this oil helps to reduce the appearance of fine lines and wrinkles. 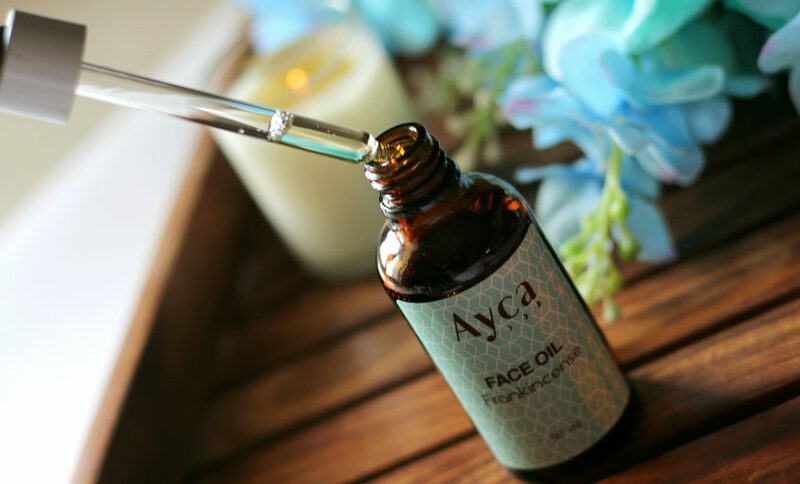 Facial oils in general replenish your skin’s natural moisture levels and helps protect it from future moisture loss. They come handy during extreme cold, dry weather may take a toll on your skin, or during the summer months when your skin may be feeling particularly sun-parched. 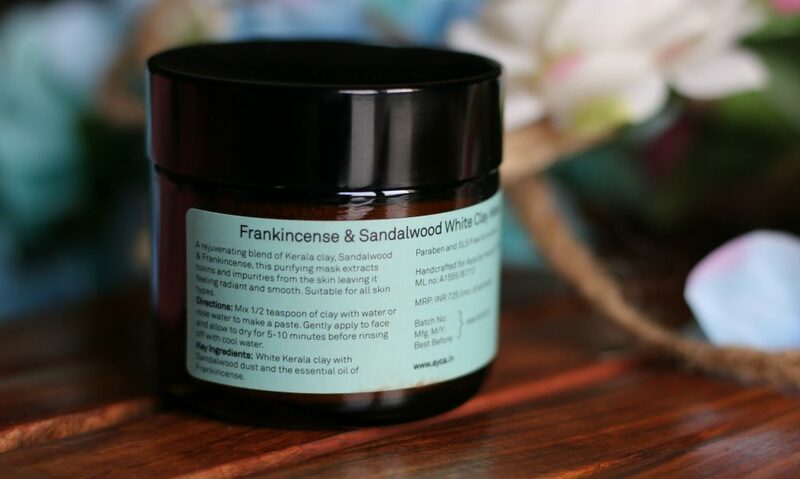 I love the relaxing aroma of Frankincense and this luxurious blend is for all skin types. The pipette dropper helps in easier application. On cleansed and toned skin. Add a few drops to your fingertips and massage in, using an upward circular motion, taking special care around the delicate eye area. 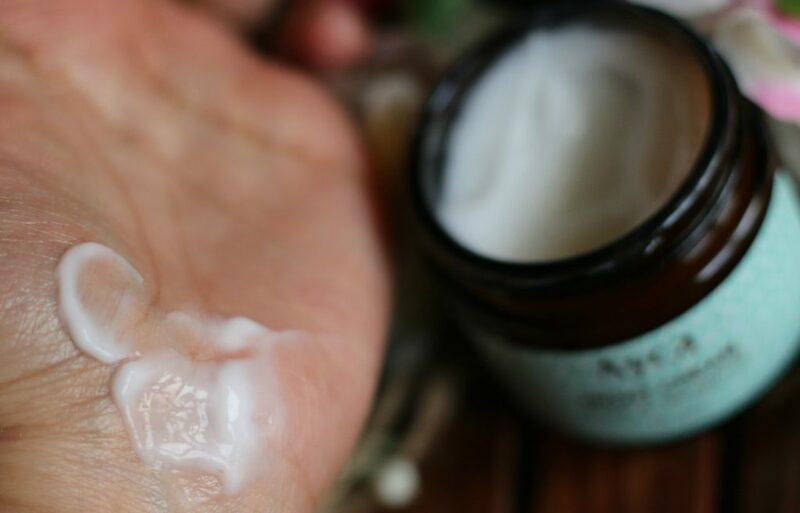 Leave it off on its own or follow up with your moisturiser. Ayca Rose & Bergamot Night Cream is a nourishing and rejuventaing cream that helps in delivering intense moisture to skin and helps with the pigmentation issues while preventing other signs of aging. 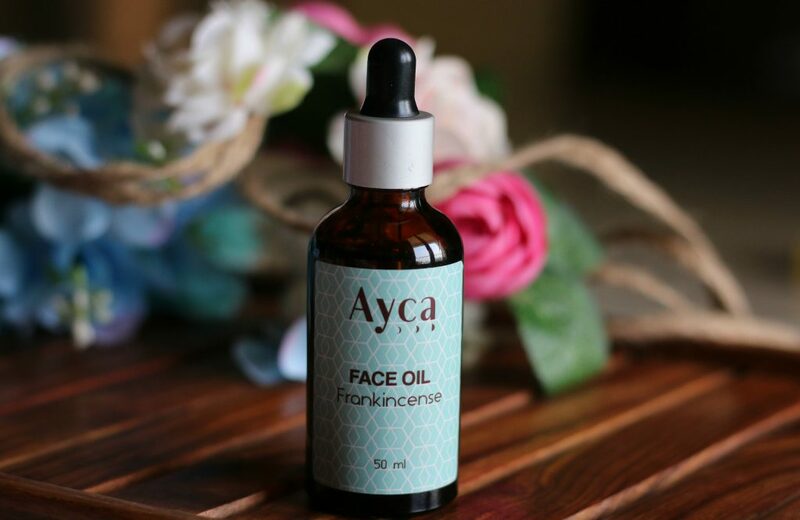 It is suitable for Normal/Dry & Mature skin types. The product comes in a round glass jar. I use a wooden spoon to take the product when I need it. 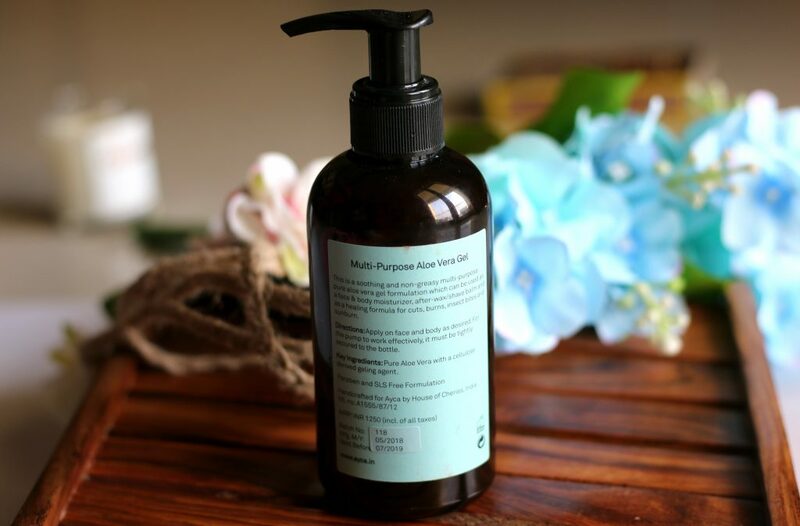 Key Ingredients: Essential Oil of Bergamot & Rose in an aqueous extract of Bay & Margosa (Neem) Leaf, Cinnamon & Cupressus Bark & Globe Thistle Flowers, Wheatgerm, Jojoba, Grapeseed, Almond & Lemon Oils in a plant derived base of Stearic Acid, Polysorbate & Glyceryl mono stearate with Beeswax. 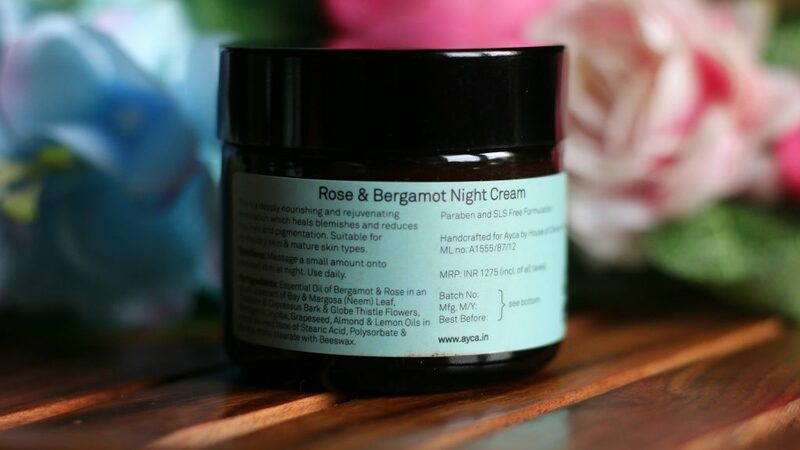 I love the consistency of this night cream. It’s very very light weight on skin and fast absorbing too. Perfect to calm down irritated skin. It has a cooling effect on skin as well. Very hydrating on normal skin. If you have extremely dry skin. You might not like it much. 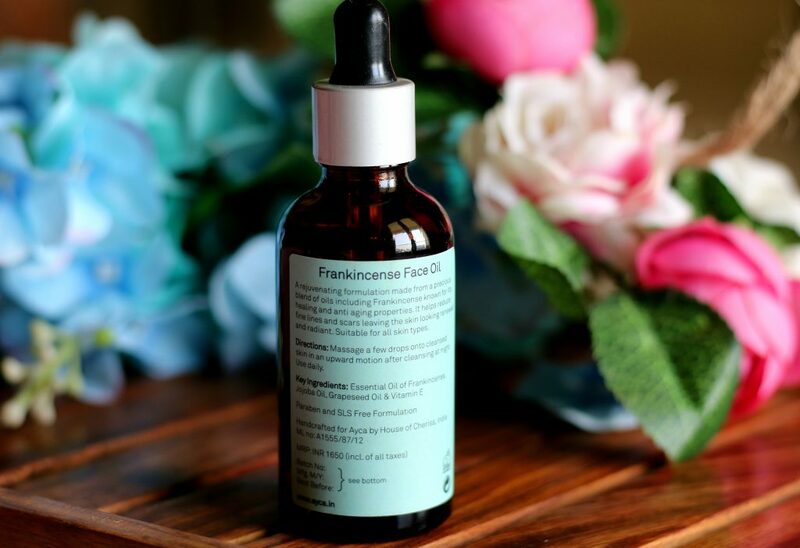 After massaging using the Frankincense Facial Oil. I apply this night cream on my face. 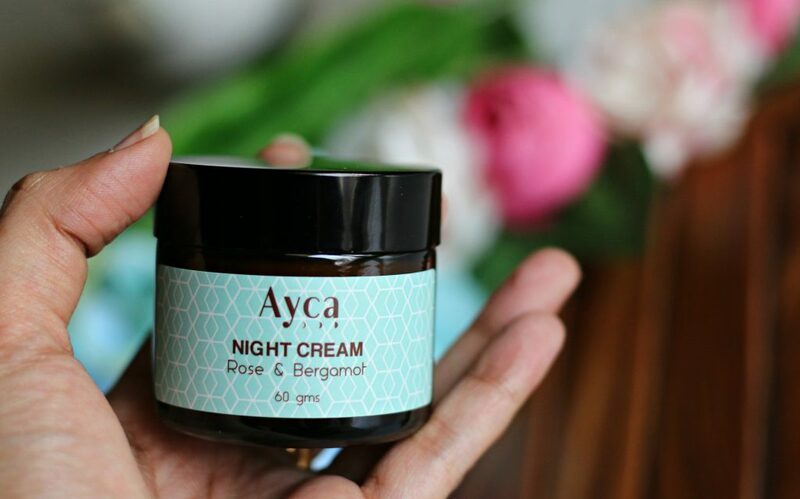 Overall, a gentle night cream which has a light weight consistency. Easily sink into the skin leaving your skin hydrated all night. Has a floral aroma which is not overpowering. Smells divine and has a wonderful gel like texture as well. Free from parabens and SLS. ** Products sent by the brand. However my reviews are honest and unbiased as always.